Don’t you agree that the phrase “I will wear what I like” is the perfect mantra for personal style aficionadas (and aficionados!) dear readers?! After taking exception to a journalist’s insistence that women over a certain age should no longer wear things like leopard print and oversized sunglasses (huh?) 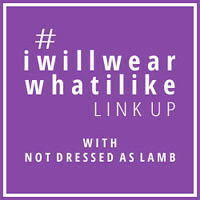 my friend Catherine of Not Dressed As Lamb responded with an #iwillwearwhatilike campaign on Instagram…and a weekly blog linkup devoted to exactly that theme!! We might not all agree about what’s considered attractive when it comes to our wardrobe choices – I bet I get some eye rolls when I’m wearing this shaggy Free People cardi! – but “pretty” isn’t always what it’s about; real personal style is a means of creative self-expression through fashion choices – and it should never be hampered by age or trends…or even gender, for that matter!! Next Post Snow day: denim mini, sequinned sweater, Chanel-style jacket, and fierce booties! This is such a beautiful look! I really love the layering 🙂 You always look amazing 🙂 I hope you and your family are having a wonderful Christmas season!